Red Tide Forecasting in the Gulf of Mexico on Every Beach, Every Day? Soon There Will be an App! Mote Marine Laboratory is excited to collaborate in the project described by the Gulf of Mexico Coastal Ocean Observing System (GCOOS) in their press release below: "Red Tide Forecasting in the Gulf of Mexico on Every Beach, Every Day? Soon There Will be an App for That." Red tides caused by Karenia brevis (K. brevis) in the Gulf of Mexico can have a devastating effect on coastal communities, where severe blooms can cause millions of dollars in tourism losses and send people with chronic respiratory diseases to their local emergency rooms. Now, a three-year $1.1 million grant from NASA is helping several organizations fine-tune current red tide forecasts with the goal of offering public health managers, coastal residents and visitors a forecast that better reflects coastal conditions on more localized scales. Improved models and forecasts for red tide conditions will help people make healthy choices about where to spend recreation time, increasing protections for public health and coastal economies. Video b-roll and video interviews available. Please contact Nadine Slimak at nadine@vettedcommunications.com for links. Forecasts for Karenia brevis red tides in the Gulf of Mexico have come a long way over the last decade. But one key to providing forecasts for every beach, every day is the development of a new smartphone application that will use facial-recognition software to identify K. brevis in water samples right on the beach. 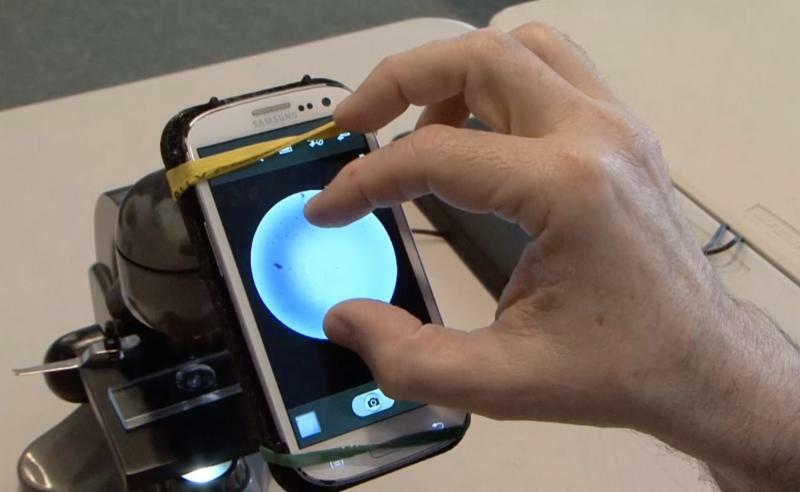 In the image above, NOAA Scientist Dr. Wayne Litaker works with a prototype that connects a smartphone to a microscope. In the top left image, Litaker pinches the image to zoom in on the water sample under the microscope. The top right image shows a close up of K. brevis in the water sample. Currently, there are several reporting systems to alert the public about red tides in the Gulf of Mexico, and each has its own limitations. Florida's Fish and Wildlife Conservation Commission's Research Institute (FWRI) provides twice-weekly reports on red tide based on cell counts from water samples but they can take several days to complete, delaying updates for the public. Mote Marine Laboratory's daily Beach Conditions Reporting System (visitbeaches.org) provides subjective information about beach conditions and is not available for every beach. Texas Red Tide Rangers citizen science volunteers who gather and test water samples operate only during blooms and do not cover the entire coast. The National Oceanic and Atmospheric Administration's (NOAA) Harmful Algal Bloom (HAB) Operational Forecast System (HAB-OFS) issues red tide advisories, via bulletin, website and Beach Hazards Statements (issued through the National Weather Service). However, these reports typically cover county-wide geographic areas and are often not precise down to specific beaches. "Our forecast abilities have come a long way since the early 2000s," said Dr. Richard Stumpf, Oceanographer with the NOAA National Centers for Coastal Ocean Science and lead investigator on the project. "When we initially created our forecast models, our goal was to help aquaculture officials know when to close shellfish harvesting areas to protect the public from neurotoxic shellfish poisoning, which is caused by eating seafood containing red tide toxins. But later research showed that the airborne toxins are not only a nuisance, but also a human health risk. So we knew we needed to protect the public from that risk as well. Today, our forecasts provide information about where red tides are and where they're going on a county level. But red tide blooms are patchy and the effects can vary greatly from beach to beach -- even when the beaches are right next door to each other. By bringing in new technology, this project will get us much closer to the goal of a forecast for every beach, every day." Key to improving the forecast is the development of a smartphone application (app) by Robert Currier, Research Specialist and Product Developer for the Gulf of Mexico Coastal Ocean Observing System (GCOOS). 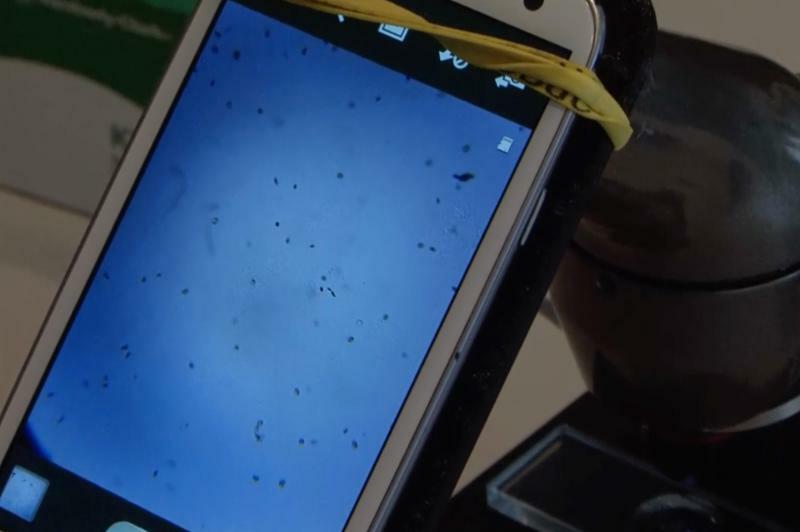 The app will allow trained beach observers with special low-cost smart-phone microscopes to collect videos of water samples that can be uploaded to a cloud-based server for automated evaluation. This system will then provide a real-time response on the presence or absence of K. brevis, along with information about whether the quantities are enough to warrant a health concern. Results and improved forecasts will be available to government and research institutions focused on public health and natural resources, with the ultimate goal of enhancing public information through NOAA's HAB-OFS and Mote's Beach Conditions Reporting System. "With this new app, we can improve red tide forecasting from an 18-to-30-mile coverage area down to the beach level," said GCOOS Executive Director, Dr. Barbara Kirkpatrick, who developed the Beach Conditions Reporting System when she was Manager of Mote Marine Laboratory's Environmental Health Program. "The forecasts will also be based on cell counts rather than subjective observations and provided in real-time, instead of the hours-to-days-long approach some of our forecasts are limited by now." 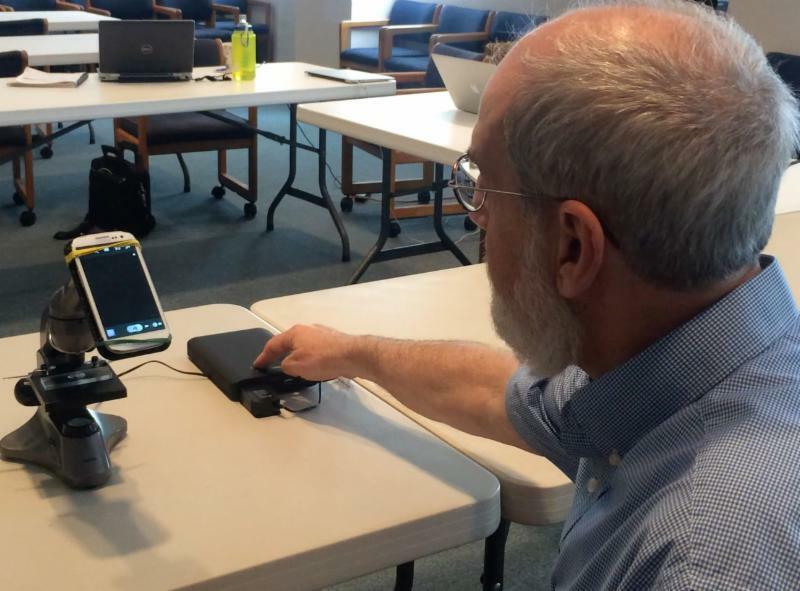 Dr. Tracy Fanara, Manager of Mote's Environmental Health Program, has been testing instrument performance and the user app for the project, working with the established network of Beach Conditions Reporting System contributors and volunteers. "This new tool exemplifies how we can transform our monitoring and forecasting of red tide using inexpensive, widely available technology. With new technologies and strong partnerships to implement them, this is an inspiring time in our field." In addition to collecting the information on the presence of K. brevis, the server will also collect the data that users upload and house it in the GCOOS data portal, which provides real-time and near-real-time information on a variety of environmental conditions in the Gulf. That will help forecasters provide a more precise picture of red tide movements in coastal areas over time and improve overall forecast models. "More data, over longer periods, means that we will be gaining a more precise picture of how red tides move in the Gulf of Mexico," Stumpf said. "In addition to providing better forecasts right now, we can also improve the accuracy of our forecast models." Andrew Reich, Florida Department of Health's Public Health Toxicology Administrator, said the new tool will help improve lives in red-tide affected areas, "As studies have shown the potential negative effects of airborne red tide toxins on public health, we've needed an effective and accurate tool to help us provide real-time information to the public. This new tool, along with better satellite models and programs to increase public awareness, should really help improve lives for coastal residents and visitors and lessen impacts on coastal communities and their economies." The code for the app is being written in Python and uses the OpenCV computer vision library -- these are open-source software platforms, GCOOS's Currier said. "By using open-source code, we hope that others will be able to take the tool that we're developing to detect Karenia brevis blooms in the Gulf and use it to develop similar applications that look for other types of harmful algae, potentially protecting public health from other HABs in the Gulf and even in other regions of the country." The research team developing a new app that will help forecast red tides in the Gulf of Mexico includes oceanographers, ecologists, computer application developers and public health experts. Pictured from left to right, front row: Andrew Reich, Florida Department of Health's Public Health Toxicology Administrator; Robert Currier, Research Specialist and Product Developer for the Gulf of Mexico Coastal Ocean Observing System (GCOOS); Shelly Tomlinson, Oceanographer, NOAA National Ocean Service; Dr. Shobhana Gupta, AAAS Science and Technology Policy Fellow, NASA Earth Science Division. 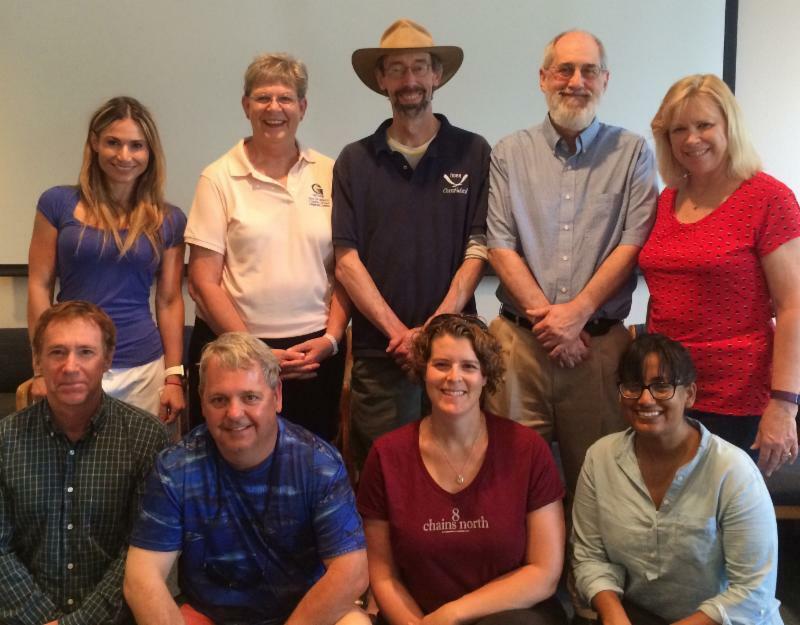 From left to right, back row: Dr. Tracy Fanara, Manager of Mote Marine Laboratory's Environmental Health Program; Dr. Barbara Kirkpatrick, GCOOS Executive Director; Dr. Richard Stumpf, Oceanographer with the NOAA National Centers for Coastal Ocean Science (NCCOS) and lead investigator on the project; Dr. Wayne Litaker, Coastal-Ecologist, NOAA-NCCOS and Sue Estes, Associate Program Manager, Public Health and Air Quality Applications, NASA/University of Alabama Huntsville. The Gulf of Mexico Coastal Ocean Observing System Regional Association is a 501(c)3 organization responsible for developing a network of business leaders, marine scientists, resource managers, non-governmental organizations and other stakeholder groups that combine their data to provide timely information about our oceans - similar to the information gathered by the National Weather Service to develop weather forecasts. Visit us online at gcoos.org. Copyright © 2016, Gulf of Mexico Coastal Ocean Observing System Regional Association. All rights reserved.